NOTICE: The 2018 filing procedures and requirements of the Secretary of State have changed. Carefully read the procedures and follow the directions to be successful. To find out the status of your HOA if current or revoked enter your HOA’s name, business name or organization’s name in whole or part – the results will return with pertinent information regarding the type of business, dates and the Executive Board. It is required that West Virginia Homeowner Associations register annually with the Secretary of State . Your HOA’s Annual Report requires update of officers, members, partners, directors, addresses & agent for service of process, and other information the Secretary of State deems necessary and important. $25 a year, if received by midnight July 1st due date. Call cashier at 304-­558-8000 to use your credit card as a payment. 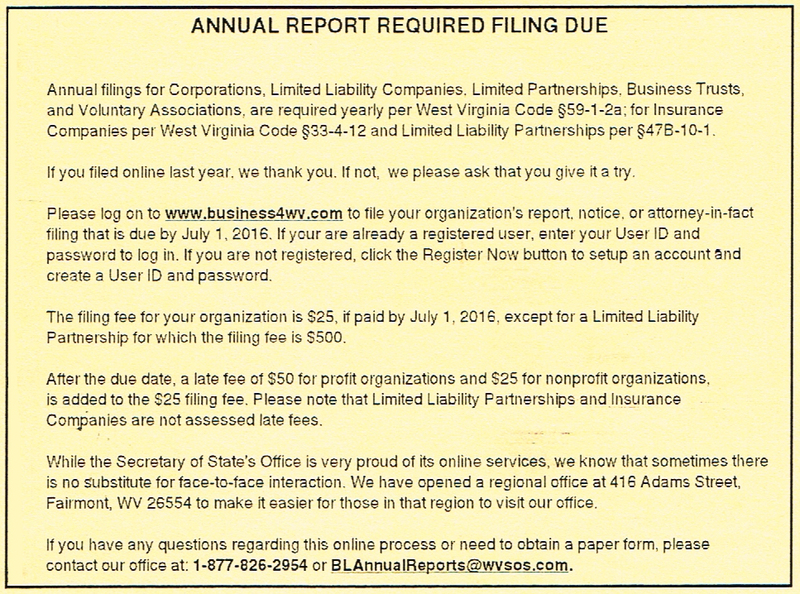 WV Secretary of State will charge document copy fees.